Instigate, equip and furnish Oncology Unit. Rooms 6 & 7 on “A” Level – palliative care rooms. In conjunction with the Cooma Lions Club the “Matrons Flat” in the old nurses quarters was refurbished for use by patients, patients families and visiting medical staff. More information below. Purchase of a navigator probe to allow sentinel node biopsy procedure which is in accordance with best practice for breast cancer surgery ensuring the best possible health outcomes for rural patients. Flowtron Hydroven Therapy System for Cooma Community Health to aid in the recovery of lymphatic and venous or mixed arterial and venous problems. In 2013 mcCr in conjunction with Cooma Lions renovated what is known as the Matron’s Flat on the grounds of the Cooma Hospital. This is a one bedroom flat with a lounge room, bathroom and a fully equipped kitchen and can be rented by out of town patients receiving treatment and/or families of this patient. Please see the staff at the front office of the hospital for further information and bookings. The Matron’s Flat was funded by mcCr fundraising events and donations with the Cooma Lions Club providing the labour for free. RIGHT: The Mary Green Memorial Palliative Care Family Room was officially opened by Mary’s family. From left: Joe, Timmy, Michael and Ted Green. 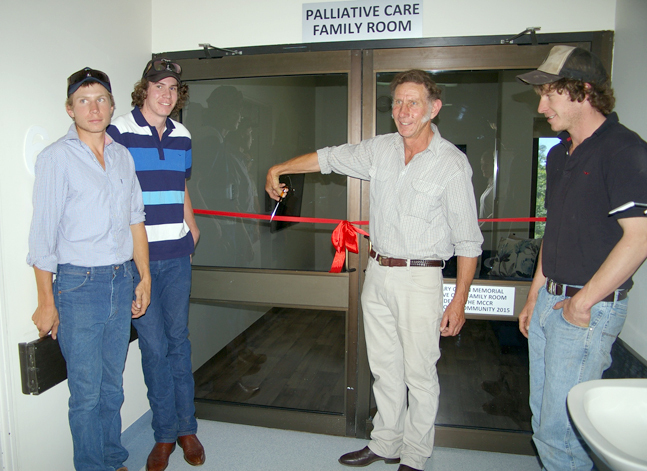 2015 saw the renovation of a room on A Level which became The Mary Green Memorial Palliative Care Family Room, named in memory of Mary Green, a great supporter of mcCr who was instrumental in getting the oncology unit off the ground. Mary became the first oncology nurse of the Oncology Unit. Sadly in 2012 Mary lost her own battle with cancer and is still greatly missed by the community. This room was funded by mcCr fundraising events and donations. Facilities include a sofa bed, TV, equipped kitchenette and dining suite. This room for the use of families of palliative care patients.